A dark compelling story of love and its more sinister elements…possession. In the aftermath of a blood transfusion that saved her life, Kara feels different. Her senses are stronger ... she can hear whispered comments not meant for her ears ... she can hear the person following her. When Jack, her stalker, reveals himself and insists that Kara has something that belongs to him, she does her best to avoid him. But he’s determined to talk to her, convinced that they’re linked through the blood she received during her transfusion. Jack is struggling against a dark and dangerous demon. His body is host to the evil power that wants Kara’s blood and will stop at nothing to get it. If Jack is able to gain control he can warn Kara. But which is stronger, the power of the blood they share or the force for evil. How can Kara help save Jack without risking her own life? What Point of View Should I Use – Getting the Writing Right. When faced with a blank page for your latest obsession…i.e. your current writing project, your first thought does not fall to P.O.V. In fact, most writers, at the early stages don’t consider point of view; they are too busy trying to get the ideas, the characters out of their heads to free up some space, so they can think. Sometimes point of view is organic and happens around your central character, around the type of genre you are writing. Other times, usually for me, in the first edit you have to look at the structure of the work and decide. There are obviously several choices when it comes to P.O.V. First person P.O.V. refers to the I, we, me, my, mine…often the voice of the heroic character. This P.O.V. feels natural to most writers because it is in the first, the beginning, signifying singular importance. Also, you only have to deal with one mind…the narrator’s and sometimes, if your characters are particularly fiery, this is a good thing. I always knew I had the run of the school…what better candidate for school president? My results are unbeatable. And I am the most popular cheerleader. The choice is obvious. (Example 1st P.O.V.). However, first is very limiting, you can’t go into the minds of other characters, you can’t catch a glimpse of the motivations of everyone on the page and you must always take on board the opinion of your main character, regardless of the validity of that opinion. Second person is really difficult and rarely done. Henry James does the second person successfully (Turn of the Screw); it works well for ghost stories, short suspenseful pieces. This type of writing is difficult to maintain and it’s hard to keep the reader engaged constantly with second person point of view. Third person is in he, she, it, they and it is the most common point of view in fiction. It offers a wide variety of potential possibilities. The reader can get inside many people’s heads, can understand different motivations, can glean insider knowledge even to the detriment of aligning with the main character. The hard part of third person P.O.V. is that it can interrupt the flow of your story. The reader has to be willing to enter the minds of a number of characters and the writer has to try to make the voices as distinctive as possible. For my book Blood Entwines the P.O.V. happened as I wrote the characters. The story is about a girl, Kara who receives a blood transfusion and suddenly finds herself taking on board strange character traits. She is aligned with her doner, who is a vessel for an evil force, a minion for the powers of darkness. To tell the story in a rounded way I wanted to show the motivations for all my characters. I particularly wanted to portray the main character, Kara, as being unreliable. She cannot and does not see/know everything but the reader does because the reader has access to the thoughts and motivation of all the characters. It was also a good choice for me in my first novel as it allowed me to tell a number of mini-stories if you like, character portrayals, to stitch them all together. Blood Entwines has four main characters and as the book progresses there are reveals and developments that come together in the end, tying all the strands. A non-linear, multiple POV narrative is challenging to readers. For me, I like to work my way, weaving from story to story. It adds an added element of concentration and immersion in the book. I also enjoy teasing out the answers to questions as the story unfolds. Blood Entwines allowed me to be very self-indulgent, catering for my own literary tastes but also pushing my learning as a new writer. I think P.O.V.s come together as the writing progresses but if you want definitive boundaries then choose before you start to write. However, it’s always good to experiment, as a writer and a reader – take on something different, expand your reading. You might be surprised what you find. Caroline Healy is a writer and community arts facilitator. She recently completed her M.A. in Creative Writing at the Seamus Heaney Centre, Queen’s University, Belfast. She published her first, award winning collection of short stories, entitled A Stitch in Time in August 2012. Her work has been featured in publications such as Wordlegs, The Bohemyth, Prole and the Irish Writers’ Centre Lonely Voice. She writes literary fiction and young adult fiction, with her Y.A. 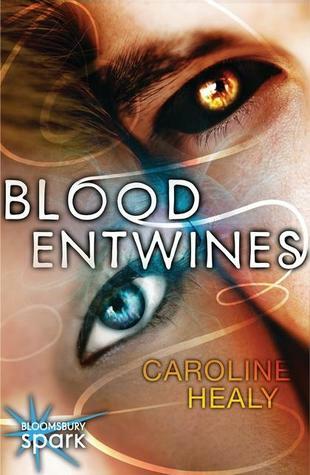 book Blood Entwines released with Bloomsbury Publishing in August 2014. Caroline loves drinking tea from mis-matched china, doing yoga, as well as reading, writing, talking and thinking about all things bookish. She also has a penchant for cake and dark chocolate. This is a really great guest post! I hadn't really even thought about POV's until I had been reviewing for awhile and started realizing how it sets a different tone. Urban fantasy is often in 1st person (especially in adult books) but I like the 3rd person sometimes so we do know more than the main character does. Thanks so much for hosting a tour stop today! I never really gave a whole lot of thought to the person & tense subject before. The book sounds amazing and I've put in on my Amazon wish list. Thanks, sounds like a good book. This is so awesome!!!! I'm so excited to read this!! I love the multiple POV style. Excited to read this book, thanks for the chance! This sounds really good, the excerpt is really good, the cover is nice too. thank you for the giveaway as well.